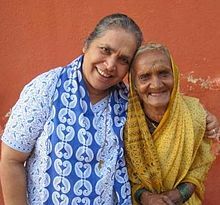 WHAT: Sister Lucy Kurien is the founder and director of Maher (which means "mother's home" in Marathi), a remarkable community and interfaith refuge for abused and destitute women and children, headquartered in Pune, India with 38 homes across the region. A traumatic incident resulting in the death of a pregnant woman and her unborn child at the hands of her drunken husband inspired Sister Lucy to devote her life to supporting battered and destitute women. She later expanded her work to include caring for underprivileged children, who literally came knocking at her door for help. Maher, whose motto is "There is always room for one more," welcomes all people irrespective of their religion or social status and values each individual equally. Since founding Maher in 1997, Sister Lucy and her team have housed over 4,000 women and 2,000 children for healing and rehabilitation. Sister Lucy’s service was honoured by the Shree Shakti Award and 2016 Vanitha Women of the Year Award. On Thursday, May 4th, we plan to come together for a reflective gathering with Sister Lucy, during her brief visit to London. I had the joy of spending time with Sister Lucy at a recent Gandhi 3.0 Retreat in India, when I was deeply moved by her humble loving spirit and incredible journey of unconditional service. It's a blessing to have sister Lucy join us for this circle, where she plans to share more about both her inner and outer journey of service. Please join us that evening to learn more about how she has come to lovingly be called "Mother Teresa of Pune." After you submit your RSVP, you will be emailed follow-up details a few days prior to the gathering. It would be great to have you join us, share a contemplative space of reflection, and plant seeds for co-creating more goodness in the world. To join, simply RSVP below and we'll send you a follow-up email with the details. Meet Sister Lucy Kurien: "Mother Teresa of Pune"
Born in South India's Kerala province, Sister Lucy moved to Mumbai with her family to access better education when she was twelve. The city's slums were her first introduction to the conditions of the poor. At the age of nineteen, she decided she wanted to become a nun and joined the Holy Cross order, which focused on teaching and nursing. However, she was inspired by Mother Teresa's work and felt called to be closer to the people she wanted to help, directly touching the lives of the poor. In 1989 she joined the HOPE organization, founded by the Holy Cross Convent to help abused women. In 1991, while she was there, she had an encounter that would inspire her life's work. A pregnant woman came to her asking for shelter from her alcoholic husband whom she thought would beat her. Sister Lucy did not know where to send her since the convent did not take lay people. She had to send her away, but promised to help the following day. "I was brought up in a secure family environment and I was unaware that one night could make such a difference to the life of a woman. That very night, her husband, in a drunken rage, set her on fire. I actually saw the blazing woman and heard her shrieks of agony. We put the fire out and took her to a hospital but she died of 90 degree burns and with her died the seven month old foetus. I was devastated." In spirit Sister Lucy retains her faith in the inherit goodness of human beings and her trust in God. She is a living example of interfaith harmony and our deep interconnections with each other as human beings. Although she is a part of a congregation, she intentionally chooses not to wear the robes to honour her deep conviction in interfaith harmony. Her homes contain holy books of all religions and in addition to being interfaith homes, they are also caste free homes where people from all castes - the tribals, untouchables, etc can come and sit together on one table. When asked what her dream for the future of Maher is, Sr. Lucy shared, “I would love to see many more people come forward and truly commit themselves to the vital work of building communities of healing and love. [...] My prayer for the future is that the fire of real Love will ignite more people’s hearts, and inspire them to join this vital work. It can be done anywhere, and is needed everywhere."